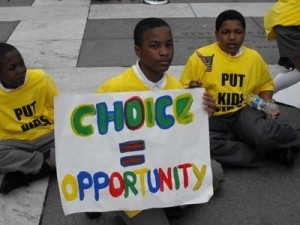 With National School Choice Week kicking off January 25th, conversations surrounding the topic are already buzzing. While I have always been a supporter of school choice, it is only recently that the subject has taken a personal turn. With one child excelling in public school and the other struggling, having choices in their individual educational needs will make a lifetime’s worth of difference. Our oldest daughter has never had a problem in school. She easily makes good grades and the traditional public school model works well for her. Our second to oldest is in her first year of public school and it is already apparent that what worked for the first is not going to work for the second. I should start by explaining that we are in an excellent school district in South Carolina and we were fortunate enough to have our second daughter placed with the same teacher our first daughter had. She is an amazing teacher and has worked hard to meet the differing needs of our children. Unfortunately, due to school policies beyond her control, we’ve reached a wall in the extra help that can be given to my child. The school cannot properly assess her needs until her next birthday at the end of the school year; meanwhile, she is quickly falling behind and at risk for being recommended for retainment. As she is in Kindergarten, we can choose to hold her back or send her on to first grade for the next school year. If we pay for outside help, she may stand a chance of moving on to first grade where she could get the extra assistance she needs. From there we have to hope that, for her entire schooling, she has teachers that will be as dedicated, compassionate and flexible as her teacher has been this year. Realistically though, it would seem that my daughter is in for a very long and very difficult educational journey. So now my husband and I are faced with making choices that will decide her fate in school. Do we try to fit her into the educational box with which she has, in only her first year, shown herself to be perhaps incompatible? Or do we think outside of that box and seek alternative solutions that may hold the key to her success? And if we look outside of the box, what choices await? Aside from the very expensive option of sending my child to private school, South Carolina has a limited amount of choice within the education system. Private school choice is not offered, however there are charter schools and online learning available. Currently there are 50 public charter schools and 6 online public charter schools in our state. Additionally, the state-led South Carolina Virtual School offers courses for students in grades 7 through 12; online students can earn high school credits to go towards their graduation from the public, private or home school education they are currently receiving. Putting those numbers and options in perspective, I have one charter school in my district that would be an option and I would have to participate in a lottery for the chance to have my child attend. Not a hopeful picture. However, opportunity may be on the horizon. Wednesday, state Senator Larry Grooms introduced legislation in the state Senate that would provide tax credit-funded scholarships to low-income and special needs students. Families with students in private school and homeschool would also be eligible for tax deductions. A similar bill was passed through the House last year, making history as the first school choice bill to do so, but it died in Senate on the last day of the session as they never took the vote. In a state that ranks 48th in the country, according to the National Assessment of Educational Progress, (despite spending more per pupil than most Southern states) and where parents have maybe one or two alternatives to traditional public school, obviously more school choice is badly needed. In her recent State of the State address, Governor Nikki Haley addressed the issue of education in South Carolina. So we’ve seen some progress. But our state still has a long, long way to go. There is no surer path out of poverty and toward a quality life than having a good education. But it’s not only that. Having a well-educated workforce is a real factor in attracting more businesses and jobs to our state. There’s a real economic element to improving education as well. I know there are some strong school choice bills that are making their way through the General Assembly, and as I’ve always said I support school choice. It will be good for the parents and children of our state to be able to make their own family decisions, and it should have happened a long time ago. Considering the recent nod from Gov. Haley, one would think the local newspaper would be informing South Carolinians on their prospective school choice opportunities. Instead, the major news publication in South Carolina, The State, seems bent on blithering about a school choice advocate, Howard Rich, who has had the “audacity” to contribute to candidates in South Carolina that support school choice. Nowhere in the pages of The State can be found unbiased information on school choice in South Carolina. The term “school choice” is used only in a passing description of Rich that precedes the amounts he has contributed to each campaign. To that I say perhaps Rich should contribute money to a new newspaper that will do their job which, apart from informing South Carolinians on the many other news items they may want to know about, would help parents like myself discern what lies ahead for my children. Fortunately, Rich is not the only out-of-stater who is willing to step up for the children of South Carolina. The Special will link the modern-day fight for educational equality to important movements that have shaped the American way of life — from suffrage to civil rights — all of which used similar whistle-stop tours to generate overwhelming support for causes that changed our history for the better. For my daughter and the 49 million other public school students in the country who’s choices are lacking, the efforts to help them outside of the box will open up a new world of opportunity in line with the freedom that endears America to the world.